Examples of Pacific Palisades mansions as mentioned in the L.A. Times article about the affluent that the new movie theater was developed to attract. 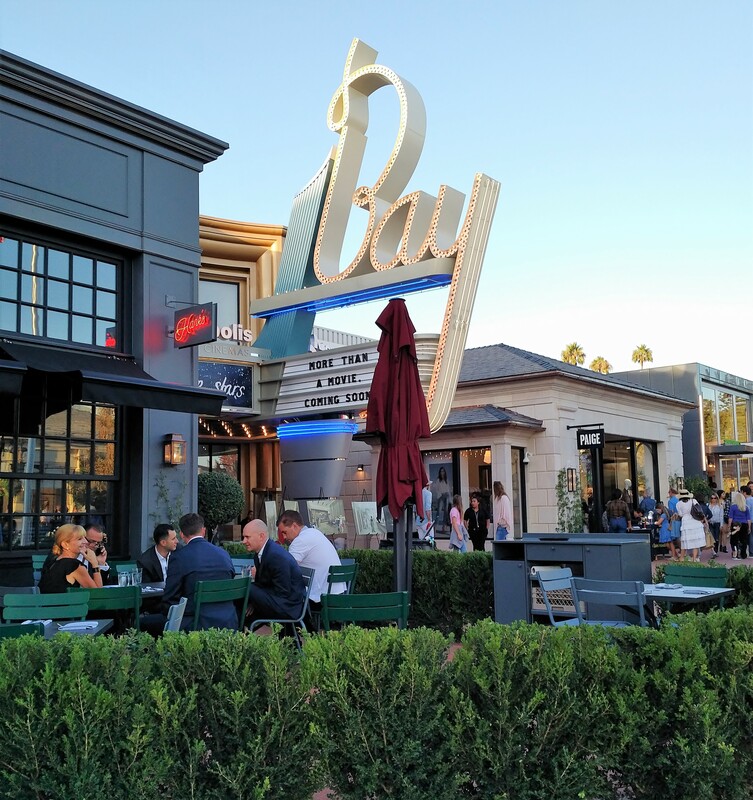 The story was ostensibly about the opening of the new Bay Theater, which is the centerpiece of developer Rick Caruso’s Palisades Village, but the writer’s depiction of our small coastal village made it sound like it had suddenly morphed into downtown Beverly Hills. I’ve lived in this town for 40 years, and for this upscale miracle to have happened right under my nose, I realized that I must have just awoken from a Rip van Winkle nap of epic proportions and have now unexpectedly discovered my recent newfound privilege and exclusivity. Last I remembered (before my long nap), I owned a 1,400-sq.-ft. bungalow that was built in 1925 on a modest residential street, and on days when the Santa Ana winds blow, this creaky old house tends to tilt a bit toward the west. Most of my neighbors’ houses look very much like mine, although a few of them have added an additional upstairs level—which has evidently vaulted them into the newly designated “affluent” category. 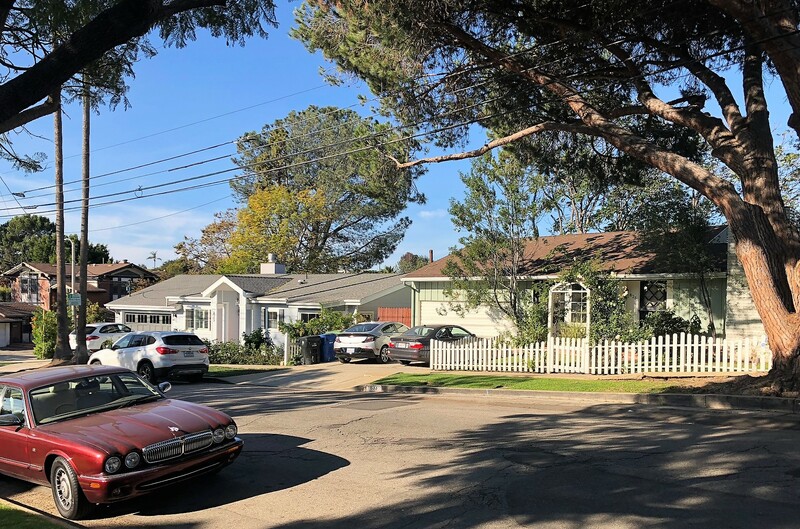 For many years, the Palisades was known as a boring middle-class bedroom community whose sidewalks rolled up before 9 p.m. Our town has never been mistaken for a Southern California destination point. We live near a small business district that borders Sunset Boulevard, better known for all its annoying stop lights, which were specifically installed to aggravate drivers passing through here on their way to somewhere else. When the Palisades Village project opened to nationwide fanfare in September and was launched with an Oscar-like bash featuring all the glamorous bells and whistles the Caruso folks could muster, we began to wonder what had just happened to our little town. The planners of the gala opening party were forced to settle for Grammy-winning star John Legend for the entertainment portion of the evening, only after reluctantly acknowledging there weren’t enough surviving members of The Beatles to reunite the band. Many of us have been noticing an undeniable influx of wealth into the Palisades in recent years that has become hard to ignore. There is more of a buzz about celebrity here than in the past, and the paparazzi are occasionally spotted swarming our village. But fortunately, I’ve not yet been forced to wear a disguise on my way into Ralphs market. Just as I was about to recant his cynical theory, a beautiful woman walked by and greeted us with a friendly: “Good afternoon, gentlemen.” After she passed by, Colin leaned over and whispered, “Wasn’t that Tyra Banks?” Colin and Tyra had completely ruined the point I was trying to make. Now what was I saying? So, if you come through my neighborhood sight-seeing from one of those star-gazing tour buses, give me a big wave out your window. I’ll be the “Hollywood heavyweight” who is wearing cut-offs and rinsing off my 13-year-old Dodge minivan in front of my exclusive two-bedroom mansion. The Bay Theater is located next to Hank’s restaurant in Caruso’s Palisades Village. Thank you for the belly laughs! You are indeed a funny man Bob!! Well said! We bought our “mansion” , all 800 square feet of it, in 1971. Having grown up in a small seaside tiwn, it seemed to be a seamless fit: hardware store, Hot Dog Show, toy store, hobby shop, and folks who said hello or helped you with projects. It suited us as a good, quiet place to raise our family. With local schools within walking distance and the beach only minutes away, we were happy. When Swarthmore shops began to die out, we worried that the Palisades would turn into a ghost town. Then, voila! Caruso bought it and turned it into Beverly Hills West. There us not one shop there that interests me. It’s like another town was plopped down where Mort’s proudly stood. I hope there are enough of us to support all the older shops, so our little town does not entirely disappear. Congratulations from one who also remembers the old Palisades and it’s residents. I hope Mr. Caruso’s view of the Palisades is not what we have really become. A town full of affluent movers and shakers who need to spend $27. per Spanish leather seat at a local theatre to know they have arrived. The article I read about the new Bay, and it’s $135,000. projector makes it very clear that it is geared to the very wealthy members of the New Pacific Palisades. tells.” This whole thing reads like a script from Keeping Up with the Kardashian’s. It does not look good on them, it won’t look any better on us. Thanks for your great and enlightening article, the same thoughts crossed my mind when I read the LA Times piece. So now I can now tell all my friends I live in a “toney” neighborhood. They may just have to look up the definition. Yay, Bob –so happy to know I’m not alone! My Mom and I are busy laughing our butts off in our mansion, otherwise known as “The Happy Hovel”, and thats right after watching some cute cat videos and the Finns raking their forest floors! High praise indeed. I shall not explore my own opinions about “Carusoville” quite yet, in public, as I have other chores to do, especially hauling 40lbs of cat litter from may car parked around the corner because strange new people are filling up my street with Honda Civics, Smart Cars and Mini-Coopers and I can’t park in front of my mansion. Jeesh, if there is any downside living amongst such affluence, its having to put up with the plebians required to serve it! P.S. I’m pretty sure Steven Spielberg has his own screening room at home, and possibly filled with Corinthian leather chairs too! This is hysterical. I needed a good laugh as I was reading this from my “penthouse” condo. I love it!! You probably expressed what many people are thinking! Wendell and I laughed so hard! This is a fantastic article. And, hey, how about that? Tyra Banks being so sweet and saying hello? She’s just wonderful. P.S. Please keep the paparazzi away from us. I don’t care who lives here. None of us like the paparazzi. 1975 we just loved it as it stood – and stayed for 20+ years. Chatting at Starbucks. Take care and keep us all updated! OMG, do I miss the Palisades of 20 years ago – sounds like I’m an old fart, and maybe I am, but the charm and REALITY life style are nowhere present in Carousoville. If I wanted to live in Beverly Hills, I would. Looking forward even more to watching movies on TV. Can I afford it the new cinema? Sure, we can give up food for a day or two. But why would I want to? Bob, you nailed it; one of your best columns ever. What you wrote and what responses you’ve received raises a serious question: is our beloved Palisades turning into an Ozarks Mountain war zone between the financial Hatfields and McCoys? Do ‘middling’ Palisadians already resent the Caruso buffs and vice-versa now? Will the community remain divided into pro and anti ‘moderization’ camps? Has that already happened. Will the ultimate Palisades status symbol become a dedicated parking space located within a hundred yards of Sunset and Swarthmore, whatever the cost? I, too, number myself in the Curmudgeon Sect, unlike some friends. I miss Mort’s, Dante’s, the French bakery, the toy store. I even miss the movie house that pre-dates the hardware store I can no longer buy bird food for my feeder at. I miss the serenity of a Sunday morning in a sleepy village of happy hobbits taking the morning off, then rising for a casual breakfast while neighborhood kids skate past one-story normal sized homes dating from the ’20s. For years, when we could afford to, my family vacationed in North Shore Kauai in the Hawaiian Islands. Why? Because it offered a charmed haven of what Hawaii meant to those of us who remember the 1950s, Elvis and Blue Hawaii: a quiet, back-water beach side town with a few funky restaurants, a bar, some kid clothes stores and not much else. Not much to do up there in Hanalei but soak up sun, swim, walk along the shore, wash off the sand, then hike into town a block or two away at sunset wearing t-shirts, flip flops and bermuda shorts and treat the kids to ramen or Bubba Burgers and a couple sno-cones. Not so bad for two over-worked, non-Hollywood chic professionals back then. Any one for a tall frosty glass of what was then? Great article! Hope there’s a part 2 and part 3 – indeed a whole series – coming. And, as someone actually born in PP (a lonnng time ago) and still living here, I have dreaded Sept. 22, 2018 since the day I heard of Rick Caruso’s project. PP must have known what was coming, and wanted it that way. BUMMER! So far, I have managed to avert my eyes when I go into the village – which is less often now that Norris is gone. Who ARE these people? Don’t they have something more profound to spend their money on than 3-figures jeans? I’m size O, but I can get good-looking jeans elsewhere…and without making a fool of myself. Great article! We moved to the Palisades in 1970 from NY and thought we’d found a small piece of heaven to start our family! We bought one of the Alphabet’s bungalows and happily raised two sons who walked to school, skateboarded to the park, played AYSO soccer. The boys have grown & moved on now, but we still live and love our piece of heaven… even if it’s now “tony” and “exclusive” to some, it’s still HOME to us… the Caruso Quad and ALL the rest that makes up the Palisades Village.